Why Does No One Talk About Harry Potter and the Cursed Child? 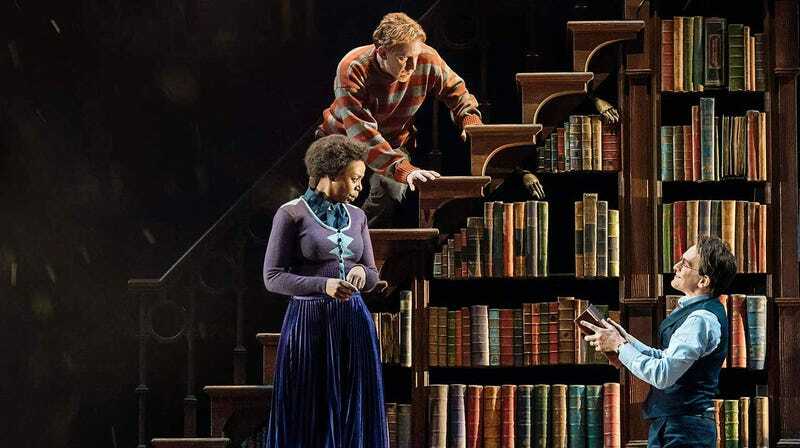 Jamie Parker (as Harry Potter), Noma Dumezweni (Hermione Granger), and Paul Thornley (Ron Weasley) star in Harry Potter and the Cursed Child. It’s wild that an eighth Harry Potter story exists in the world and almost no one talks about it. I’m referring, of course, to Harry Potter and the Cursed Child, the stage production that debuted in London back in 2016 and opened in New York earlier this year. The show is an official, J.K. Rowling-approved continuation of her massively popular Harry Potter franchise, but for many reasons, it still hasn’t dug itself into pop culture like its predecessors or other popular franchise sequels. Now, the reasons for that are fairly well-documented. First is the fact it’s a stage production in two cities globally (for now), and while fans can buy and read the script, its true form is largely inaccessible to most people. Then there’s the fact that Rowling didn’t write it. She helped conceive the story with Jack Thorne and John Tiffany but left the actual writing to Thorne. Many fans have made a bigger deal of this than it deserves, as Rowling obviously was hugely influential on all the major decisions—but, no, technically, she didn’t write it. And yes, there’s the fact many fans simply don’t like it. They feel the whole thing is too fan-servicey. Too different from the classic Potter tone. The characters are too obnoxious. And many think one character, in particular, is very, very problematic. That’s a spoiler, though, so we’ll get back to that in a minute. Draco Malfoy (Alex Price) talks to the Wizarding World in Harry Potter and the Cursed Child. Having said all of that, I still think it’s weird people aren’t talking about Cursed Child right alongside Deathly Hallows, Half-Blood Prince, and even Fantastic Beasts. Sure, it’s in a unique format and yes, it’s very different from those stories in a lot of ways. But it’s still Harry and his friends (and this time, his family) getting into a big, action-packed adventure against evil. Even if it’s The Godfather Part III of the Harry Potter franchise, it’s still part of the Harry Potter franchise. Sitting down to actually watch Cursed Child in person, it becomes pretty obvious why the show is its own cursed child. And that’s because of the simple fact that most people can’t see it in its intended form. I was lucky enough to see the show in New York a few weeks back and, frankly, it’s magnificent. Reading the words on the page is one thing. Seeing actors on stage is another. Maybe while reading you were imagining grown-up or made-up versions of Daniel Radcliffe, Emma Watson, and Rupert Grint. Watching Jamie Parker, Noma Dumezweni, and Paul Thornley (or whomever else is playing Harry, Hermione, and Ron) in person changes that. You forget about the actors from the Potter movies. These people are those characters now. And at that moment, your Potter adoration and nostalgia comes rushing back. You remember why you love this franchise, these characters, this world, and you realize you are surrounded by that world at that moment. It’s a very powerful, emotional feeling that, in turn, makes a few complaints about the story feel insignificant by comparison. That happens too when you see the absolute majesty of the production itself. The sets, the scene changes, the costumes, actual magic—all of those elements help make Cursed Child feel so much bigger than you can imagine by just reading the script. Add to that the show’s length (it runs about five hours and you have to see it in two parts) and the entirety of the experience becomes completely overwhelming. You are in a room witnessing the eighth part of Harry Potter’s story, one you can only see in two places in the world. Harry Potter and his son Albus (played by Sam Clemmett) have an emotional moment. Then there’s the story itself which, like the experience of watching the show, is so overwhelmingly massive and impactful, a page can hardly attempt to contain it. Performed on a stage, though, at a specific pace, with pauses, music, cliffhangers, etc., everything about it becomes more focused and manageable. This is good, because the specifics of what happens basically takes all the imaginative stuff from the seven Potter books and shoves it into one story. First, you have to come to terms with Harry Potter being an adult with kids of his own; right off the bat, that’s a little difficult to comprehend. Then there’s the structure, which takes place over many years. You also have to recall all the character-developing interactions from the original books (or movies) to appreciate some of the established relationships. There’s no refresher course. Finally, you have to be okay watching a “Harry Potter” story where “Harry Potter” isn’t the star. He’s hugely important but, really, story is more about his son, Albus, who teams up with Scorpius Malfoy (son of Draco) to try and save Cedric Diggory, hoping to prove their worth in the Wizarding World. Yes, the same Cedric Diggory who died in Harry Potter and the Goblet of Fire several decades ago, which means Albus and Scorpius have to use a time turner (a device used in the books) to go back in time. Admittedly, it’s awkward for a Potter story to center itself almost entirely on the concept of time travel. It’s weirder still when that time travel is possible thanks to a special time turner that can go back in time further than usual. All of that feels a little forced. Eventually, though, the boys’ actions in the past screw up the present in all kinds of wild ways, leading to Voldemort overcoming Harry and taking over the world. Albus and Scorpius (Anthony Boyle) hatch a plan. It’s a lot to take in but damned if it’s not exciting. Going back into the other books, while risky, opens up all kinds of wonderful, dynamic, challenging opportunities and Cursed Child deals with all of them and more. It’s a huge ask for the audience to be okay with a time travel story of this magnitude, but because it’s a world of magic, even if it’s not comfortable, it makes sense. Then there’s the “cursed child,” a new character herself, Delphi, who is revealed (final major spoiler here) as the child of Voldemort and Bellatrix Lestrange. Here’s where most people really have a problem with Cursed Child, because this whole character creates major issues. First, she challenges a major part of the Potter universe itself because her existence humanizes Voldemort and Bellatrix. They were lovers, which feels almost too nice for them. There’s also the little matter that Bellatrix would have had to have the child before she died in the Battle of Hogwarts, which takes place in the books. So Delphi was born during the books. However, none of the books or movies ever mention her pregnancy, so it feels very retconned. Then again, we don’t spend a lot of time with Bellatrix in the original stories so it’s absolutely plausible nine months passed at some point without us knowing what she was doing. And in that time, she could have had Delphi, sent her away, and boom, here we are. Still, Delphi is a bit of an issue. But as you watch Cursed Child in person, she almost feels like a non-entity. Yes, she’s there throughout and becomes the major foe in Part II, but so much is happening in between it’s very easy to forget about her. This is good, because it means seeing the production in person smooths out yet another aspect of the story many fans have problems with. The cast of Harry Potter and the Cursed Child. Walking out of Harry Potter and the Cursed Child is a transformative experience. You’ve seen the next chapter in a beloved, timeless story unfold just for you (and a few hundred other people). It happened. It’s canon. And it makes sense how most people not having that personal experience has held the show back from reaching the heights of its more popular predecessors, both in print and on the big screen. But once you see the show, there’s no way to get it out of your head. No way to forget these characters, this story, and for this story to become as much a part of Harry Potter lore as anything else. You can see Cursed Child now in London’s West End, on Broadway in New York, next year in Australia and San Francisco, and in 2020 in Germany. All the info is on the official site.